Freestyle Music Park, with it's rides all up for sale is seeing more activity now then it has since it's doors last opened in 2009. 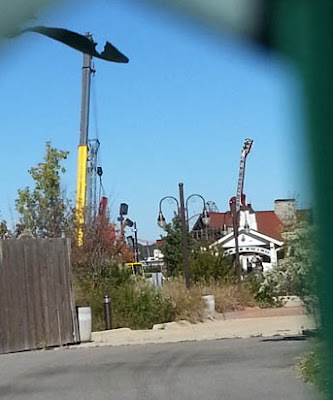 This image was posted over on Screamscape and shows a crane now in the park. They believe this is removing the WaveSwinger ride. Since the rides have gone up for public sale, rumors have been flying left and right. Some are saying that many of the rides have been sold to an undisclosed Asian park while others say that 'Time Machine', the B&M Looping coaster has been sold to an unknown park in China. Nothing has been confirmed. However, as of right now all the rides are still listed as "For Sale" on ITAL (www.italintl.com).